Pete DeBrular and the Garveston Twelve. A few weeks back, I received an email from a member of the Parish Council in the village of Garveston, England. He was looking for survivors of a World War II airman named, Edward DeBrular. Garveston is a quiet community of some 300 residents, located 14 miles west of Norwich. Sounds like my kind of project. 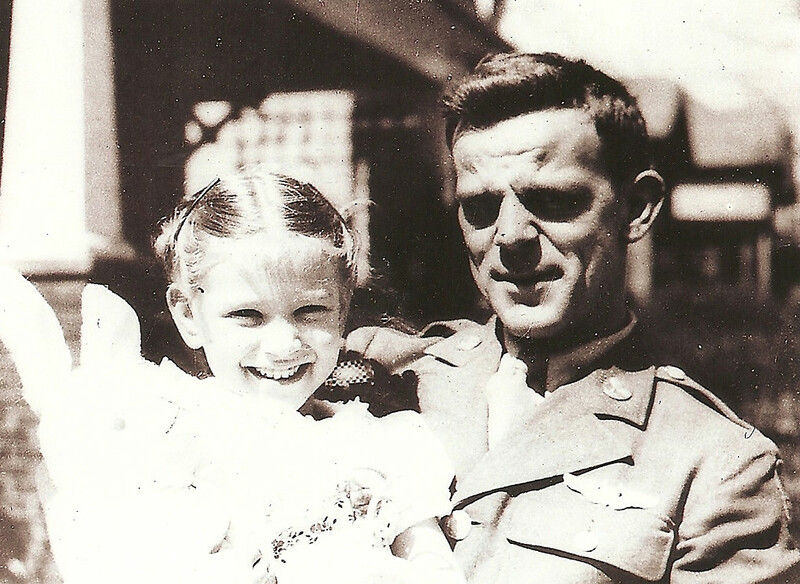 Pete DeBrular, with niece Naomi - 1942. At 5:00 p.m. on June 4, 1944, just two days before D-Day, B-24 Liberators from the 492nd Bomb Group took off from their base at North Pickenham, England on a bombing mission over German-controlled Avord, France. Among the convoy, airman Edward “Pete” DeBrular, served as a waist gunner aboard a B-24 bomber, piloted by Lt. Ray Sachtleben. Shortly after takeoff, another bomber in the tight formation bobbled. Lt. Sachtleben took evasive action to avoid a collision, stalling his own bomber. In saving the lives of members on the other plane, Sachtleben and his crew, including DeBrular, were doomed. Their Liberator came crashing down in the small village of Garveston, England, demolishing two houses, thankfully unoccupied at the time. The bomber was soon engulfed in flames. Local townspeople and members of a Fire Fighting Platoon, the 2033 Engineers, at great personal risk, battled the blaze and attempted to rescue the crew. When the bomber’s ordnance exploded, all was lost. Not only had the bomber’s entire ten-member crew been killed, but also two American firefighters. Garveston would not forget. The idea of a Garveston B-24 Memorial, honoring the twelve Americans lost in the crash and subsequent rescue attempt, was first formulated in November 2010. Several living residents in the town still remembered the day that the “big silver plane” came crashing down from the sky. The thought was to honor the brave Americans before the event passed from the living memories of Garveston residents. The Memorial will consist of a black marble stone supported on a brick base. The stone will be engraved with the names, age, rank and position of those killed, along with an emblem of the 8th Air Force and a silhouette of a B-24 bomber. The Memorial will rest in a quiet corner of the village green, with a backdrop of native trees. A bench will provide seating for those who wish to be alone with their thoughts. A Book of Remembrance is also planned, and will be kept at the village hall, briefly telling the story of each member of the brave lot. The Memorial will be solely funded by the residents of Garveston, so that future generations may honor and respect those who offered the ultimate sacrifice. And so, the reason for the original email—the finished Memorial will be dedicated in a ceremony being planned for June 6, 2012. The parish council is on a mission to track down family and friends of the Garveston Twelve, and invite them to the event. Once I heard the full story, I was all in. Tune in tomorrow for more on Pete DeBrular, the Garveston Twelve and the search for Pete’s family. What a wonderful memorial and tribute for the family of Pete DeBrular. My hope is that Tom and his wife will have the opportunity to see the finished memorial and to recognize how many people appreciate the sacrifice his brother and family gave. Well put Kathy. Like you, I think we should take every opportunity available to show our appreciation to this brave lot. The Garveston Twelve Memorial will be a truly beautiful tribute. My uncle, Ted Bunalski, was one of the Garveston Twelve. Although he died before I was born, my brother and I have learned a great deal about him and how he died within the past couple of days from the Internet. We are very proud of Ted and tremendously grateful and honored that people thought enough of him and the others who perished on June 4, 1944 to erect a monument in their honor. Someday we hope to visit it. Great to hear from you! Your Uncle Ted is a true hero, willing to sacrifice his own life in an attempt to save the bomber crew. If you ever do get a chance to visit the monument, I’ve got a list of folks eager to meet you and show you around. Best wishes.